However, there also are sub variations of these five Regional amulets which most people will also class within the Benjapakee collection, such as the Pra Kong Lampun, the Pra Beum Lampun, are alsop two pra Kru amulets of Lampun Province which are as highly valued as the Pra Rod.Each Region has its own ‘Benjapakee’ with its own top five amulets of its region. One can also find ‘Benjapakee’ collections of one single type of amulet, such as the ‘Benjapakee’ of Look Om Sacred Powder Ball amulets or the Benjapakee of Top Five Regional Pra Pid Ta Amulets.. This is of course a Folk Tradition and so one can find the word Benjapakee used in more than just the case of the classic historical Ancient Amulets known as the classic original Benjapakee Collection. Extremely rare Master-Class hand Carved Amulet empowered and Blessed by the Great Luang Por Derm of Wat Nong Po, in Nakorn Sawan. Luang Por Derm was Born on Wednesday 6 February 2403 BE and Died on Tuesday 22 June 2494 BE. He was one of the Greatest Masters of Thai Buddhist History, whose amulets, and famous 'Mitmor' ritual spirit knives are legendary around the whole wide world, for their authentic power, and Master Class Status. The Wicha of Luang Por Derm is continued to this day through his Looksit of the various Master Lineages. 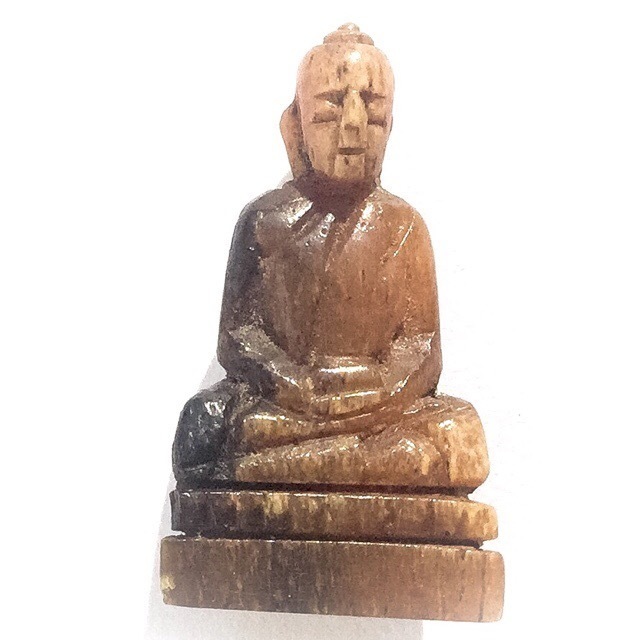 HIs carved ivory, and wooden amulets are rare items, for they were made by individual Artisans who were Initiated and had received the Wicha, and 'Korb Kroo' Ritual Empowerment as permission from Luang Por Derm himself. Only such Lineage Master Initiates were allowed to perform carving or knife forging for Luang Por Derm, and even to this day after his passing, all the Posthumous Editions of amulets which derive from Masters who are Initiates of Luang Por Derm, must use only amulets and Artisanry which has been made by an Initiated Artisan. 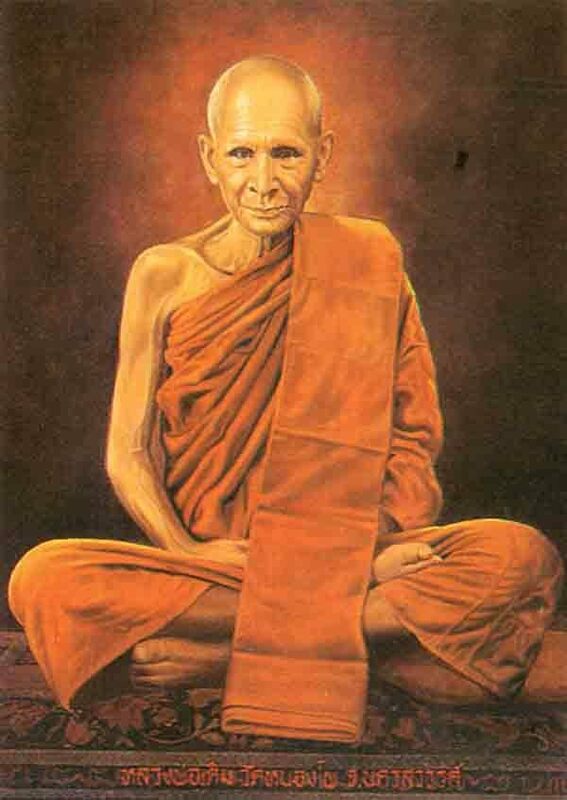 This great Master and Abbot of Wat Nong Po, is believed to have chosen to be born on Earth in the village of Nong Po, to lighten the sufferings of Buddhist People, and to bestow them with Blessings to lead them on their way towards Happiness, and Alleviate their Sufferings, and Poverty. Legend tells that Luang Por Derm is believed to have been born once before with the same parents in Nong Po Village, but he died at an early age. The mother and father were so sad, and at the burial, it is said that they took a ritual knife, and made some marks on the feet of the corpse of the child. The mother and father then prayed for him to be reborn with them, and that if this miracle would truly happen, that the newborn return of the child, would be marked on the feet with these marks. It is said that when Luang Por Derm was born, that he had the very same lines marking his feet, exactly where his parents had made marks on the feet of their deceased son. It is hence believed that this was the first Miracle of Luang Por Derm. 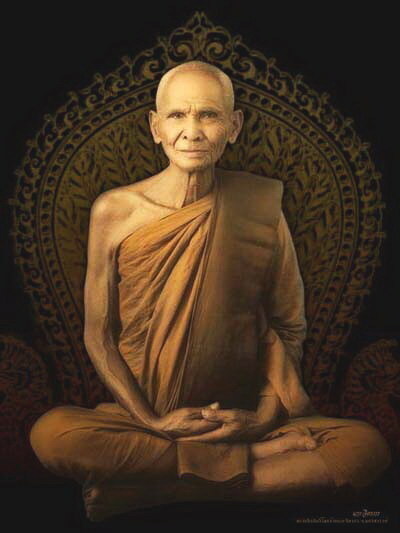 Luang Por Derm did not study much at school during his childhood, but after he ordained into the Sangha as a Buddhist Monk, he gave intense efforts and great interest to learn Bariyatti Dhamma (Theoretical Dhamma) with Luang Por Chom the then Abbot of Wat Nong Po at that time. He never stopped practicing and studying the various aspects of Dhamma Practice, Vinaya, Wicha Akom (Sorcery) and Laekh Yant Agkhara Khom, which He studied with Nai Pan Choo Pan, who was an Adept Sorceror who was resident within the enclave of Wat Nong Po Temple. Nai Pan was a direct looksit of Luang Por Tao of Wat Nong Po who was an ancient Master Sorceror and Abbot of Wat Nong Po. He studied for seven years with this Master Sorceror, until his passing.. 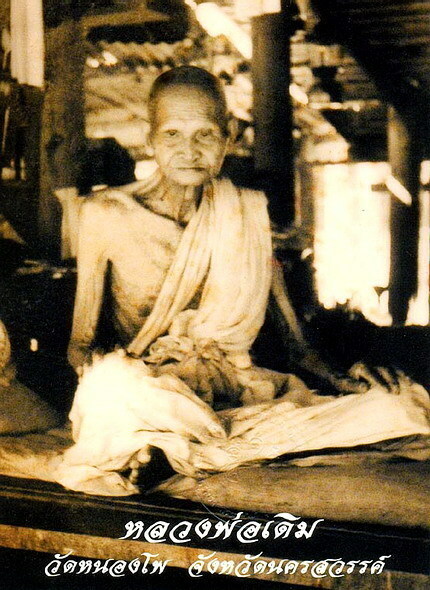 When his teacher Nai Pan passed away, Luang Por Derm then continued to practice and study Wicha with Luang Por Mee at Wat Bang Bon, another temple of the district in Nakorn Sawan, where he remained for a period of 2 Years. He also learned Tripitaka with Luang Por Num of Wat Khao Tong. He also learned with Ajarn Yaem (a Lay Master who was Genius at both Dhamma Sermon Giving, and Wicha Akom). 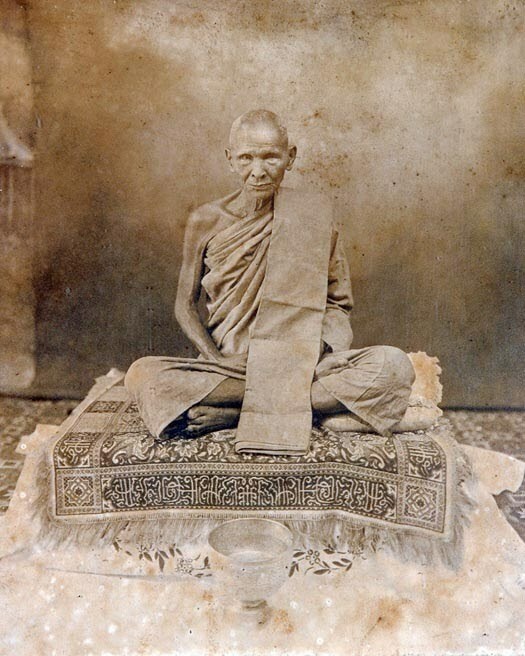 Luang Por Derm learned how to Preach Dharma, until he became an expert Preacher of Dhamma, and became recognised for his Immense Ability to interpret the difficult Dhamma Lessons and simplify them to explain to the Local Folk. Devotees would beseech him from all around the Province to come and Preach Dhamma to them. 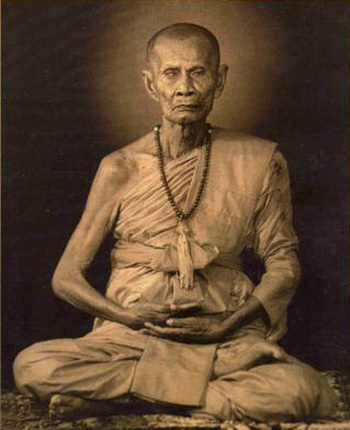 Luang Por spent many years performing Preachings. until one day he stopped, and said that every time he wold go to tell others how to practice, and they wold give donations, that he thought it would be better to stop, and focus on teaching himself. he would send his apprentices who had learned well from him in his stead. Luang Por Derm then retired from Sermon (Tamma Tesana) practice, sometime around his eleventh year of ordination. he then focused on developing Vipassana Kammathana methods of self transformation, and dedicated himself extrememly diligently to develop the causes of enlightenment (Arahantship). he became famous for his ability to sit erect for many many hours, beyond the ability of other Masters. It was here that Luang Por's ability in Wicha Akom began to ascend to a very high level, and his magical abilities began to take form and become extremely powerful.The fruits of his practice and studies which began with Nai Pan, and the many Kroo Ba Ajarn who had passed Wicha on to him flourished. Luang Por still continued throughout this time to study with many other Masters, most of whose names are not known, for Luang Por Derm never really told others about his secret Masters, nor did he brag about the things he had learned and the places he went too leanr them. It is however known that Luang Por did learn intensive Wicha Akom Saiyawaet with Luang Por Saban and Luang Por Taes of WQat Sap Tale, and Luang Por Wat Khao Nor. Luang Por's powers became famous for his ability to empower amulets with Metta Maha Niyom, Maha Lap, Kong Grapan Chadtri and Klaew Klaad effects. His powers were famous for their ability to banish demons and evil forces, and that his amulets were able to invoke Miracles of many kinds. HIs Wicha was so powerful that its' superiority over that of other Great Masters of the time, became so famous that Devotees from around the whole region flocke to Wat Nong Po, to beseech all kinds of Blessings and amulets. The vast number of different kinds of Wicha and amulets which people would ask for, is indeed a mark of his great abilities, which seemed to know no boundaries. Some would ask for images or statuettes, other would ask for a Photo with a Yant inscription, others would ask for See Pheung or Metta Oil. They would ask for Paeng Talk empowered by him, Pha Yant, Takrut, or Holy Water. One of the most desired and requested amulets requested would be the Whaen Ngern Long Yant, which was a ring with Yantra and the image of Luang Por Derm sat meditating on the head of the ring. As the Burapha Asia war time began, many more devotees began to appear, filling the temple, in immense numbers. In this time it became popular for devotees to bring a 12 inch piece of Prajiad Cloth with them, and ask Luang Por Derm to imprint his footprints in ink on the cloth, to be used for Bucha and Protection. Some people would ask for a single footprint, others wold ask for both feet. This is why some Pha Yant have one foot print, and others have two. Luang Por Derm's feet became permanently stained with the prolonged practice of inking the Cloths. Some devotees would even ask Luang Por to spit on their heads. Many students of Magic then began to approach Luang Por Derm to beseech bestowal of Wicha, which Luang Por wold agree to when he saw the student to be worthy. he wold always warn the students though, that once they had learned to empower things properly, that they would no longer be able to think of themself and their own pleasure. What he meant by this, was that once they became powerful Masters themselves, they would recieve no peace from the villagers, and become as pestered by devotees as Luang Por derm himself had been throughout his life. He meant by this, that the successful manifestation of magical power, is not something that is desirable for ones own self, and that great renunciation is necessary to perfect this practice.